Briahna Hendey is a first year M.S. student in the SENR Graduate Program, specializing in Environmental Social Sciences. Her research interests involve using psychological principles to drive environmental conservation. More specifically, she is interested in cognitive bias, risk behaviors, and habit formation as pertaining to sustainable diets and human-wildlife conflict. 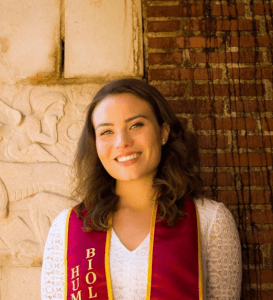 She graduated from the University of Southern California (USC) in 2016 with a B.S. in Human Biology, and a minor in Psychology. After graduating at USC, she served as a research assistant in the Psychology Department at the University of Colorado, Colorado Springs, and promoted conservation education and environmental stewardship as an EdVenture Mentor at the Cheyenne Mountain Zoo. In her spare time, you might find her swimming, hiking, or drawing.